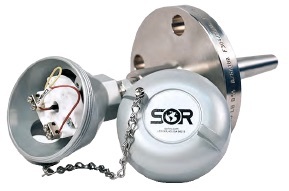 SOR manufactures a complete line of thermocouple elements, Resistance Temperature Detector (RTD) sensors, thermowells, industrial assemblies and specialty temperature sensors. All RTDs are 100% tested to insure that the accuracy and the continuity of the product have not been affected by the manufacturing process. The standard sheath material on all RTDs specified in this section is 316SS. Other sheath materials and coatings are available. All industrial thermocouples are manufactured using a high purity mineral oxide insulation and a metallic sheath. The standard sheath material unless otherwise noted is 316SS. Review the embedded catalog below, or download you own SOR Temperature Sensor Catalog from this link. SOR Temperature Sensor Catalog from Instrument Specialties, Inc.